I heard of Walking Tacos a couple months ago, I think from a friend on Instragram (Be sure to follow us!). I was of course curious, but until recently didn’t look into them much further. What is a walking taco you ask? It’s pretty funny to call them that I think, because 1 there is no tortilla, and 2 can’t you walk around and eat any taco – I mean, you don’t need a plate for them. So that is why I am going to call them Taco Salad in a Bag. Taco salad is like a taco, but in salad form, with chips instead of a tortilla. And in this version, you dump all the ingredients into a little bag of chips and voila, taco salad on the go. 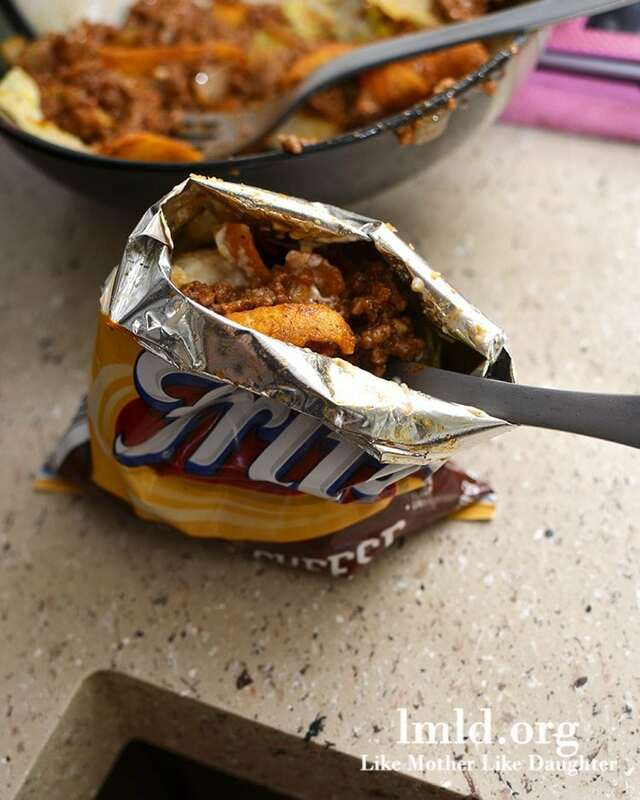 I grew up with taco salad over chili cheese fritos. That’s the best way to have it I think. But, if you don’t want the extra delicious flavor you can use plain Fritos if you want, or a small bag of tortilla chips would work too. Also, because we recently made homemade Doritos Locos Nachos, I think that nacho cheese or cooler ranch Doritos would also be a tasty chip base! So basically, you cook up your ground beef and season it with whatever you like, set it aside to cool a little (just a little), and your favorite bag of chips (explained above), and your favorite taco toppings; cheese, lettuce, corn, black beans, sour cream, salsa, etc. Toss everything in the chip bag, mix around and yum – taco salad in a bag! 1. Cook ground beef, garlic and onion in a saute pan until ground beef is browned, garlic is fragrant and onion is soft. 2. Add taco seasoning, cumin, chili powder, garlic salt and tomato sauce. 3. Allow to simmer over medium heat for about 5 minutes until sauce gets a little thicker. 4. Set meat aside while you prepare your other ingredients. 5. Open a bag of chips per person and drop in meat and desired toppings. Enjoy this simple and delicious dinner on the go! Ps. This was maybe the hardest thing ever to photograph, so I apologize! If you slit open the side of the bag instead of the top it works a little better and you could probably get better pictures too! Great advice thanks! I’ll have to try that next time! Looks yummy, just don’t make them with Fritos (GMOs) or any other non-organic corn chips! I like using Nacho Cheese Doritos for walking tacos. YUM! I’ll have to try it with nacho cheese doritos next time! Thank you Melissa! Let me know if you try it!